Kitchen Cabs Direct LLC is the leading Wholesale Supplier of Kitchen cabinets in North Bergen, New Jersey. The experts of Kitchen Cabs Direct have been working closely with homeowners in North Bergen, New Jersey for many years to help them select the right wholesale kitchen cabinets to suit their needs. Kitchen Cabinets is your 1 stop shop for Wholesale kitchen cabinets in North Bergen, New Jersey! Kitchen Cabinets is your 1 stop shop for Wholesale kitchen cabinets in North Bergen! We carry a variety of wholesale kitchen cabinets to make your selection a lot easier. If you are having a hard time choosing a kitchen cabinet, you can consult with one of our expert specialists at Kitchen Cabs Direct for a professional recommendation. Many of our Wholesale Kitchen Cabinets in North Bergen are quick sellers due to the fine quality, high grade of each cabinet and amazing wholesale prices. We will help you choose kitchen cabinets that accent the counter tops, tiles and other design elements in your kitchen, while ensuring they are functional for your needs. All of our custom wholesale cabinets are handcrafted and specially designed to make your kitchen stand out. We offer a wide range of affordable wholesale kitchen cabinets at competitive prices and kitchen cabinet installation services in North Bergen, New Jersey that are perfect for any type of kitchen. You can contact one of our professionals to come out to your location in North Bergen to give you an estimate on installation services. You can also visit our gallery page to see our top selling lines of kitchen cabinets in North Bergen. Kitchen Cabinets Direct gives you the one-on-one, personal service of a small company; at the same time, offering you large scale kitchen cabinet resources such as the latest in design, professional craftsmanship of all natural wood products, and a wide variety of hardware and special features to help customize your kitchen or bath to meet your personal needs and maximize functionality! Call us today at (201) 655-2240 for a free kitchen cabinet estimate as well as a free demo of what your kitchen will look like anywhere in North Bergen, New Jersey! 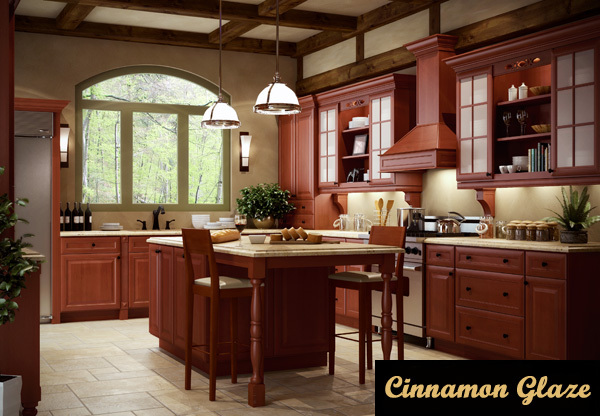 Above is our line of Cinnamon Glaze kitchen cabinets, which has been one of our most popular choices of kitchen cabinets by customers in North Bergen, NJ. Call us today at (201) 655-2240 for a free kitchen cabinet estimate as well as a free demo of what your kitchen will look like anywhere in North Bergen, NJ! 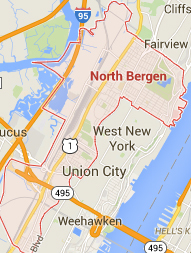 Kitchen Cabs Direct has just moved most of their operations to Clifton, NJ which is less than 10 miles away from the great city of North Bergen. We have our main showroom conveniently located for customers to come visit at 269 Parker Avenue in Clifton. Lots of street parking is available. Kitchen Cabs Direct has been providing different kitchen cabinet services for residents all around North Bergen, NJ. Over time, the residents have gotten to know us and have recommended us several times for many different types of kitchen cabinet projects.